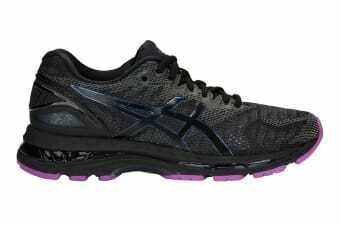 Run in complete comfort with the ASICS Women’s Gel-Nimbus 20 Lite-Show Running Shoe, allowing your foot to move naturally and fluidly without compromising on support. FlyteFoam midsole for effortless bounce back. Feel supported with every stride when you wear ASICS Men’s Gel-Nimbus 20 Lite-Show, equipped with 3D-printed upper and gradient mesh to give you more toe room whilst seamlessly wrapping around the foot for lightweight comfort. Get smoother bounce back in your with FlyteFoam and SpEVA foam midsoles, giving you softer landings and easing pressure point discomfort.